Lavera Vegan Detox Effect Mask purifies your skin deeply by getting rid of all the impurities associated with air pollution. Thanks to its formula rich in active ingredients, it neutralizes free radicals and strengthens the natural defense of the skin. Composed of natural clay with purifying virtues, this mask absorbs harmful substances and promotes good blood circulation. Thanks to its very fine particles, this Vegan Mask gently exfoliates your skin and eliminates dead cells. Result: your skin texture is refined and your pores are tightened ! 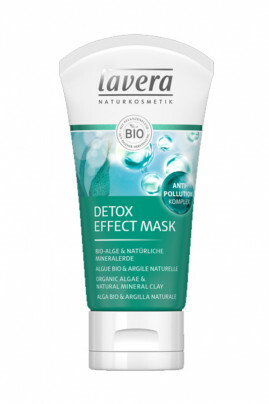 On dry skin cleansed beforehand, apply the Detox Effect Mask Lavera in a thin layer. Avoid the outline of the eyes and lips. Leave for 10 to 15 minutes then rinse thoroughly with warm water. Depending on the needs of your skin, you can use this mask several times a week.